In other words, both Di Maio and Salvini will enter as equals, but the question is who will be the real leader behind the scenes: whether the Five-Star leader, who has seen his poplarity fade rapidly in recent days, or the vocally anti-establishment and anit-immigrant Salvini, who Lega has almost caught up with the 5-Star in recent polling. Why most important? Because Tria is the supposed compromise finance minister, replacing Savona, who will instead be in charge of European Affairs. And, as we noted earlier, Tria was expected to be far more moderate (read: "not Euroskeptic") than Savona; and the moment his nomination was announced earlier in the day it sparked a sharp rally in Italian bonds ad stocks. What has spooked the establishmentarians in the early rounds of due diligence is the following article from December 2016 published in the Formiche, titled "Vi spiego la competizione truccata in Europa che favorisce la Germania" or translated "I'll explain the rigged competition in Europe that favors Germany" in which Tria, like other run-off-the-mill euroskeptics, criticizes the European monetary union and its fixed exchange rate for allowing countries - such as Germany - to run high external surpluses and says fiscal policy should compensate for that lack of flexibility. 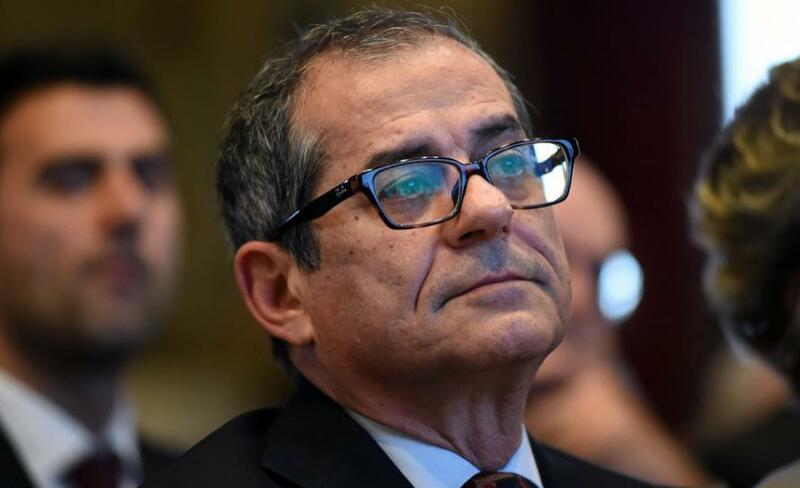 Meanwhile, as Bloomberg's Lorenzo Totaro and John Follain report, Tria publicly called for a debate on the euro in both Italy and in the rest of Europe, saying that "the biggest danger is implosion, not exit," in an article co-written with Renato Brunetta, a senior lawmaker of ex-premier Silvio Berlusconi’s Forza Italia party. In the article published in March 2017 in In Sole, looking at the outlook for the euro-region, Tria said that the "German economy’s growing surplus shows that monetary expansion, without a policy that aids economic convergence between the various countries, merely fuels an imbalance that puts us in conflict with the rest of the world." 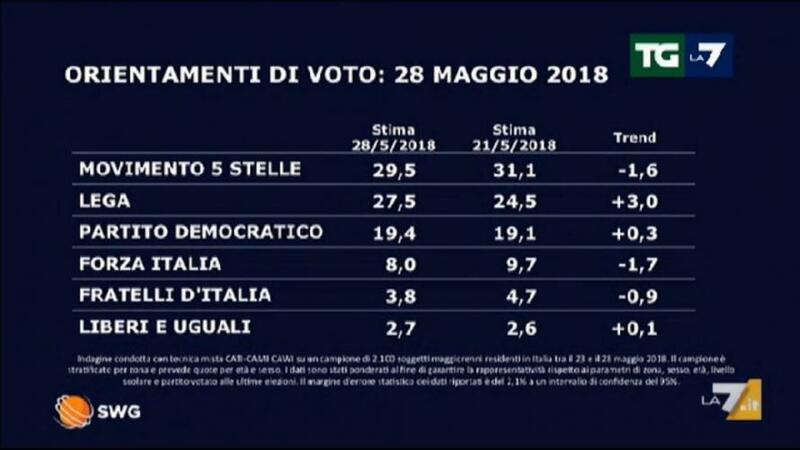 In other words, it appears that Salvini managed to replace one Euroskeptic with another, and instead of Savona, it will be Tria who will push for exploding the Italian budget, i.e.using fiscal stimulus, to offset Germany's unfair advantage, i.e., back to the square one we were over the weekend. "I think it's hard not to notice that the UK has an independent CB, as it does not belong to the EA, and they haven't signed any Fiscal Compact deal." "We will see but based on the information we have today, we feel that the Brexit vote is not as irrational as it has been described. Our problem, however, is Europe, not the United Kingdom, and the fact that European rules do not allow us to quickly come to grips with a banking crisis that is not only Italian and which risks once again becoming systemic (and it is interesting that in the aftermath of Brexit are European banks to lose much more value on the stock exchange than the British ones) is a proof of the fact that it is in the EU that irrationality is prevailing, not in the United Kingdom. And in any case, the real question remains as a boulder: why does the eurozone grow so much less than the United Kingdom?" In a December 2016 post he comments on a note by Savona voicing agreement about Italy's need for a competitive currency devaluation... "I'll explain the rigged competition in Europe that favors Germany."... 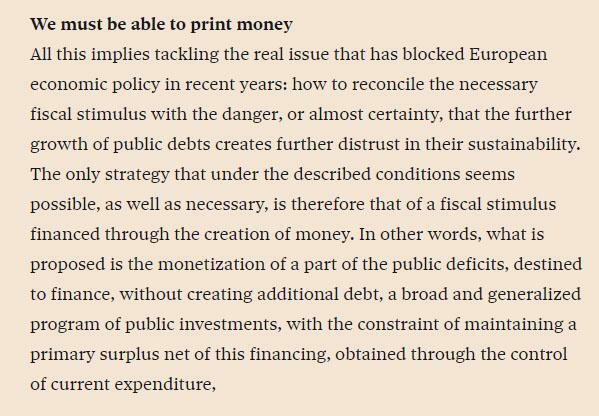 he follows it up with an article last August, in which he makes it clear that the euro is, in fact, "reversible": "Mario Fraghi is not right when he says that the EUR is irreversible, unless he clarifies the necessary reforms for EUR survival." ... and what the Italian president's, and the market's reaction, will be then.